Calcium carbonate is a white powder commonly found in rocks and in shells of marine and land organism, pearls, and egg shell. The main applications of calcium carbonate are in paper, construction industry, paints, plastics, ceramics and food. It is also found in agricultural lime which adjusts soil properties and acts as a fertilizer. It is commonly used as a calcium supplement or antacid. Calcium carbonate is processed into different types; grounded or GCC, precipitated or PCC and coated precipitated or CPCC. The particle sizes in PCC are smaller than GCC and thus it is more effective as filler in products such as paper for better brightness, opacity and printability. PCC also offers better retention than other fillers and reduces fibre consumption as it fills the paper effectively. It is less abrasive than GCC due to the smaller size and thus the paper machine lasts longer and has greater speed, productivity and readability. However, paper containing PCC has poorer formed than those containing GCC. GCC is cheaper and provides relatively high brightness. GCC also creates a porous surface due to the large particle size and as it is hydrophobic, it liberates water readily. PCC is coated with small amount of fatty acids such as stearic acid or other organic materials to be used in non-aqueous systems to obtain a coated precipitated calcium carbonate or CPCC. The coatings allow greater compatibility and easier dispersal of PCC in polymer or solvent. Overall, the coating enhances the performance and efficiency of the PCC. The enhanced performance in the CPCC differentiates itself from GCC and it is commonly used in polymers such as PVC. Most industrial calcium carbonate is extracted by mining or quarrying. The pure form can be produced from pure quarried sources such as marble. Pure calcium carbonate minerals include calcite, aragonite and vaterite. Industrial sources of calcium carbonate include rocks such as limestone, chalk, marble and travertine, and shells such as eggshells and seashells. Ground calcium carbonate (GCC) is made from crushing limestone to create a powder like form which is graded by size and other properties for different purposes. It can be prepared from calcium oxide. Water is added to calcium oxide to give calcium hydroxide, and carbon dioxide is passed through calcium hydroxide to precipitate calcium carbonate. Precipitated calcium carbonate (PCC) is derived from this method, which has very fine and controlled particle size on the order of 2 microns in diameter. Coated calcium carbonate is made from precipitating calcium carbonate by coating it with stearic acid. 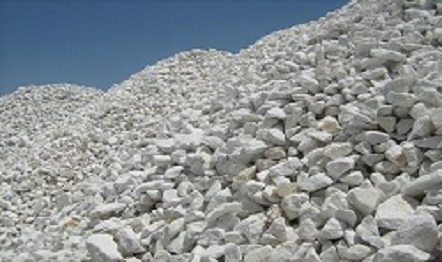 Typically, GCC is used in the construction industry, as building material by itself, such as marble, or as an aggregate of limestone for road building. It is also a raw component of cement or as a starting material for lime which is important for materials such as glass by burning in a kiln. It is also used to make mortar for bonding, building materials such as bricks, concrete blocks, stones and tiles. Typically, CPCC is used as filler in plastics to improve mechanical properties such as tensile strength and elongation and electrical properties such as volume resistivity. Polypropylene compounds are filled with calcium carbonate to increase rigidity, especially to withstand high temperatures. It is used as filler in thermosetting resins and is mixed with other ingredients to form compression molded poker chips. Calcium carbonate is known as whiting, and it is commonly used for many glazes in its white powdered form. The whiting acts as a flux material in the glaze when the glaze is fired in a kiln. Ground calcium carbonate will not scratch most materials such as glass and ceramics and have a moderate effect on softer metals such as copper. Typically, PCC is used as an extender in paints, particularly in the matte emulsion paint which has chalked or marble typically 30% by weight in the paint. PCC is used by itself as it can be used as a white pigment or with additives as white paint or in whitewashing. In the paper industry, PCC and GCC is used as a filler in paper during the alkaline paper making process to make the paper bright and smooth. It can also be used to coat the paper white.